It’s officially winter — regardless of what the weather feels like outside — so you can be sure that Old Man Winter is hovering around with Jack Frost at his beck and call. When it’s cold outside we retreat inside to nest and escape from the harsh elements of long winter days and seemingly endless winter months. For me, this is the perfect time to surround myself with the people, the memories and the comforts that create the pleasures of a well-appointed home. I’m house-proud no doubt, and you should be too. Whether you own, rent or rest your head somewhere for one night, the environment we choose says a great deal about who we are, what we love, and what makes us comfortable. My home is a snapshot of my soul. One visit to Rosebrook Gardens will reveal a deeper part of who I am. Winter, in particular, reminds me of why I have such a love affair with my home. Even in the harshest climate, I can summon spring indoors with flowers, colors, textures, furniture — and the key elements of my interior garden design concepts such as urns and garden finials. I enjoy these elements inside, and they comfort me through the long winter months. Jump-start your love of the season and spring into spring with simple home dÌ©cor ideas that transition your space from the winter blues to warm punches of color and texture that mimic the burst of spring. Begin your design by focusing on what you love about your space. Learn what you like: colors, textures, and styles. Although your taste may change over the years, your core likes and dislikes will not. If you hone in on the basic elements of your own aesthetic style, building a spring dÌ©cor theme is easy, because once you identify what you love you can maximize its beauty for spring decor. Maximize Light, Symbols of Life, and Natural Textures. I love my views of the garden through my true divided-light windows. So rather than cover them I dared to go bare! That’s right, no window treatments covering up the view. I painted the trim in an oil base high-gloss white. The results allow me to enjoy the details of the windows, while admiring unobstructed views of the garden, regardless of the time of year. A fresh coat of high gloss paint on trim reflects the light and will give a spruced-up feel to any space without your having to invest in a complete paint job. This is a great do-it-yourself project, as the results will give you a look that is cool in color, clean and modern. A fresh coat of paint brightens any room. Create an accent wall with a fresh bold color of the season. Believe it or not, orange, plum and shades of gray are all big design trends right now. The visual impact is huge and the commitment minor as an accent wall takes much less time to paint than an entire room. Although you will read many varied opinions of what wall to choose, I feel the best option for a high impact, bold color accent wall is one that is solid, without doors or windows. However, that’s not always possible, so then look for where the focus of the room is — behind a headboard, around the mantelpiece — and consider that space. Painter beware, however, that while these bold colors look fantastic in magazines, most homes don’t come with a stylist and decorator to help create a cohesive design in the space. SMARt tip: Want to avoid ending up with a shocking wall that doesn’t match anything else in your home? The best design solution I can recommend is to paint your accent wall a shade three to four shades darker than the adjoining walls. This is a safer alternative but still provides visual impact. Why follow a trend when you can create your own? Reflection creates light, light creates energy and energy creates a special ambiance in any room. Whether it’s a silver trophy filled with bright colored candy, an extra mirror or a glass tabletop — all capture and reflect light beautifully. Apothecary jars are a must have for any room. Fill them with moss balls, shells, or even birch branches. These vessels reflect light while allowing you to display tidbits of nature for all to enjoy. My Grandmother changed the curtains each spring and fall for a fresh new look. Me, I change the lampshades: black for the winter months and a light paper shade for spring and summer. Quick, easy and if I do say so myself, quite clever. Keep rooms feeling alive with a plant, a bowl of fruit or cut flowers – anything that offers a fragrant aroma. Bulbs are a perfect way to introduce color and fragrance into a room. They are long lasting and in the spring can be transplanted into the garden for years of enjoyment. Your local grocery store can be a great resource for forced bulbs. All you have to do is transplant them into a decorative cachepot and top them off with some lime green Reindeer moss for a totally professional look. 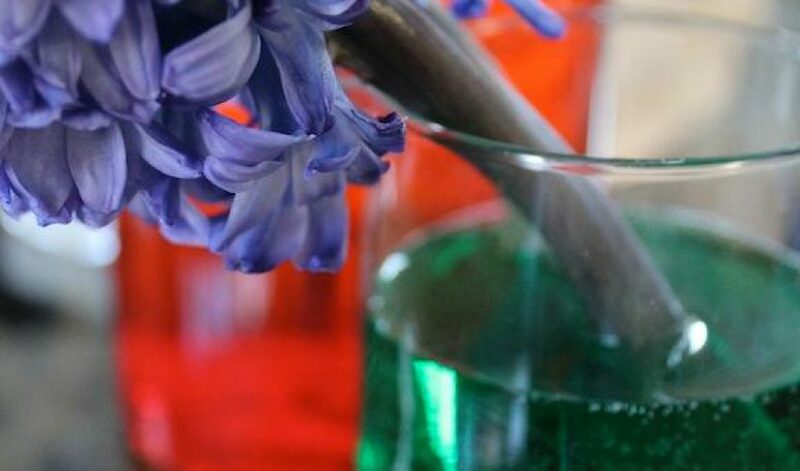 Here’s a fresh new idea: put cut flowers in a glass vase with colored water. I love this look. With just about any color of the rainbow available, you can match your personal style and taste with the flowers or go with a bold unexpected color for that “wow” factor. Who knew that just a few drops of food coloring could become a great design element? These, such as wicker, are making a huge comeback in interior design. Nothing says Mother Earth more than embracing her resources. A natural element such as wicker offers balance to the manufactured items in a space. Your eyes will gravitate to the texture and the organic look and feel. An ottoman, chair or even an oversized tray will do the trick and have long lasting effects. Discover wicker as a new design resource, not just for inviting spring into your home, but also for an updated nostalgic look. Believe it or not, your firebox is also a great space for springing into spring action. If you have a fireplace and you’re tired of lugging around wood and bagging ashes, then staging your firebox is the idea for you. Truthfully, birch logs perfectly stacked horizontally and layered traditionally in a firebox is not an earth shattering new look, but birch logs piled vertically inside a firebox will definitely spark your imagination. You can literally fire up some early spring design when your fireplace is not being used. Ready to do it yourself? Your “Springing into spring” action plan should be springing full force now that I have sprung you free from the winter design doldrums. You can do this! You just needed me to MARk it all down for you!